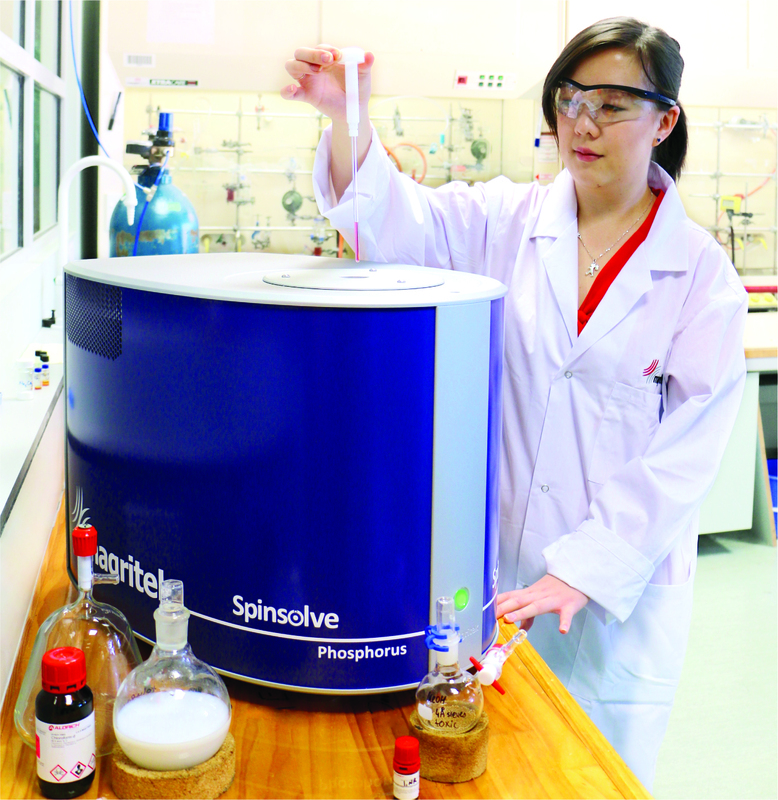 Recent years have seen the rapid growth of benchtop analytical techniques with uses in teaching, research and industry. Benchtop NMR instruments bring the advantages of space saving; they do not require special laboratory conditions or advanced, highly-trained operators; and they may be operated in environments which may benefit from the simplicity of mounting on a trolley for portability between laboratories or to bring the system to, for example, a fume hood to enable reaction monitoring. The Magritek Spinsolve Benchtop NMR spectrometers have repeatedly demonstrated the highest performance in their class in terms of superior sensitivity and resolution. The Spinsolve Phosphorus extends that capability to include the 31P nucleus. 31P is a 100% natural abundance nucleus commonly found in many organic compounds. The high NMR sensitivity of 31P combined with its large chemical shift range, simple spectra, and absence of impurities in the background spectrum make 31P NMR suitable for routine purity assessment and tracking reactions The magnet design and thermal control, together with the internal lock, provide remarkable long term stability which means minimal requirement for optimisation sequences (shimming). Compact and convenient, it is easy to operate and with low cost of entry and maintenance, Spinsolve is a most attractive proposition for laboratories today. The simplicity of the phosphorus spectrum combined with the high sensitivity of the Spinsolve instrument makes Spinsolve Phosphorus suitable for purity assays. These are illustrated in new literature from Magritek. For example, impurities can be detected at sub 1% levels in a sample of 300mM nucleoside phosphoramidite in deuterated chloroform. This is important due to its use in the synthesis of oligonucleotides. In another example the oxidation reaction of triphenylphosphine to triphenylphoshine sulphide is followed. These chemicals are important in their use to analyse certain sulphur compounds. Of particular note is the clean separation and minimum number of peaks in the spectra which makes monitoring of the reaction straightforward. Users have found the Spinsolve software platform beautifully simple and straightforward to use due to the clean and intuitive user interface. It incorporates the ability to easily switch between different nuclei offered by the system via simple software command. Scripts are used to automate experiments. A range of script templates are provided for easy user modification. Scripts are displayed graphically to provide a clear picture of the progress of any sequence, a feature which is ideal for monitoring the state of the system during reaction monitoring. It is even possible to switch nuclei inside a reaction monitoring sequence.